This year my goal is to continually provide my styling tips, helping you all create the best outfits! So you may be thinking what is monochromatic?! The word itself means single (“mono”) color (“chromatic”). Creating a monochromatic outfit is putting together pieces of the same color. Don't think that you're just supposed to wear the exact same color from head to toe. Monochromatic outfits are made up of different shades and textures of the same color. By texture, I'm meaning mixing fabrics like leather, suede, and fur. The cool thing about this style is that you create a combination with pretty much every color. If it's your first time trying this look, start with neutral colors like gray, black, and navy. If you're feeling yourself, you can try hunter green, red, or burgundy. 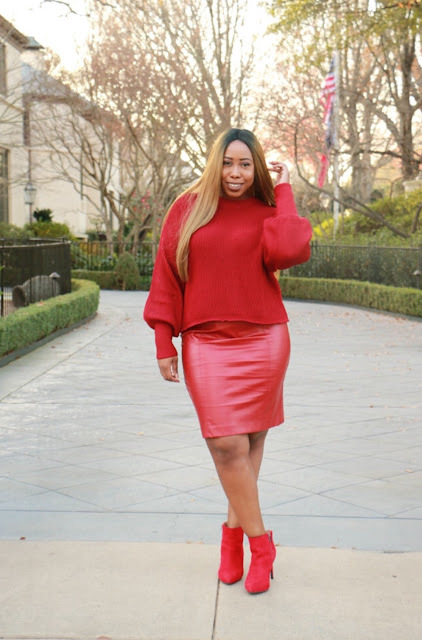 For my personal look, I chose a bulky sweater and balanced it with a fitted leather skirt. For my shoes, I opt for some suede booties. Note: My ladies with wider hips (like myself), be sure to place the darker pieces on the bottom. For my petite friends, monochromatic outfits can make you appear taller because the outfit is creating one seamless line from head to toe. If you try out this look tag us on Instagram @fyijoycelynn and use the hashtag #b2bstyleguide! !